Below is a comprehensive list of Frequently Asked Questions. Take some time to read through them - perhaps someone else has wondered the same things as you? If you still have questions feel free to email us at anytime. Ocean Light II Adventures? Q16. Should I get trip insurance? Q2. Can I pay by credit card? Q17. 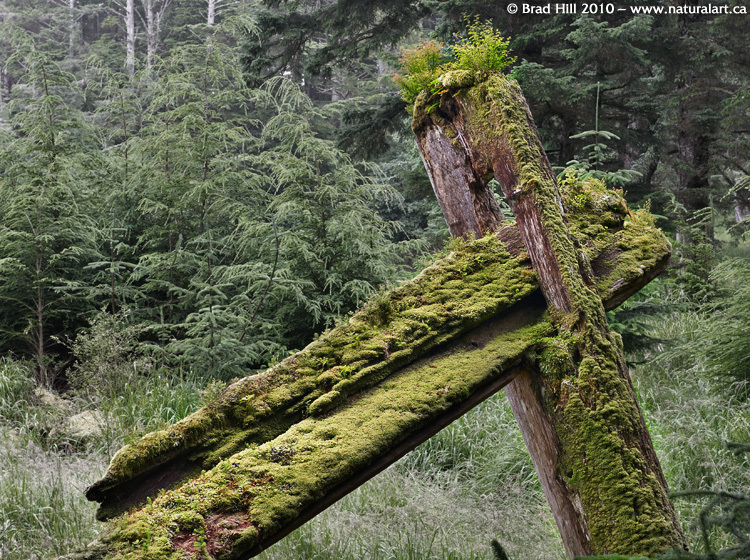 Why do your Great Bear Rainforest Explorer trips start in one place and end in another? pay a single supplement? Q18. Should I bring hiking boots? Q4. How close will we get to the bears? Q19. Is alcohol allowed on board? bear viewing? Q20. Do you offer custom tours? Q6. What is the maximum group size? Q21. Will we see grizzlies in the Charlottes? Q7. Are your boat trips good for families? Q22. Will we fish on tours with Ocean Light II Adventures? Q8. Can I bring my laptop? Q23. What is a Spirit Bear? Q9. Can I charge batteries? Q24. I like to kayak. Are there kayaking opportunities on all your tours? necessary? Q25. Do you offer mothership kayaking tours and why would I choose to go on one of these? Q11. Is a sleeping bag necessary? Q26. How close will we get to the orcas on the Marine Mammal Explorer trip? Q12. Will I need a tripod? Q27. Are there facilities on-board to dry clothing/gear that may get wet during daily activities? Q13. Can you accommodate my dietary restrictions? Q28. Do I really have to stay within the suggested weight restrictions for my baggage? Q14. When do I have to pay for the trip? Q29. I notice that you offer special photo tours as well as your standard tours. Are there good photographic opportunities on your standard tours or do I have to go on a photo tour to get good chances to capture great images? Q15. What if I need to cancel? Q1. Why would I choose to travel with Ocean Light II Adventures? 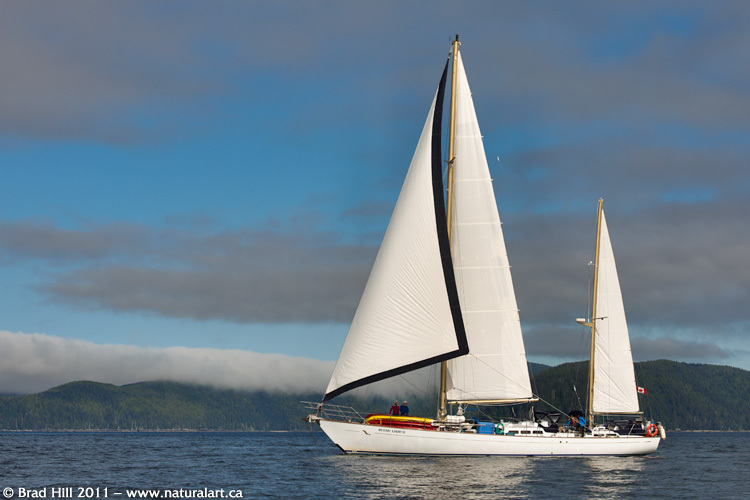 Ocean Light II Adventures has been in operation on the BC Coast for 33 years and our experience and expertise in the areas that we visit is unsurpassed. We keep our groups small and intimate so that we can move about in our wilderness settings more efficiently and safely. Our boat, the Ocean Light II is a beautiful, spacious and comfortable yacht and it is expertly maintained and fully equipped. Q2. Can I pay by credit card? No, sorry we do not accept credit cards. You can pay by personal cheque, by direct wire transfer, or - if Canadian - by Interac e-Transfer email bank transfer. Please note that there is a $15 CAD charge for direct bank/wire transfer payments. Q3. As a single traveler, will I have to pay a single supplement? No, we do not charge a single supplement. However you will most likely have to share a cabin (two separate bunks) with another guest of the same gender. Q4. How close will we get to the bears? Within the Khutzeymateen Sanctuary bear viewing guidelines have been set up. We must follow the guidelines and approach the bears to within safe distances. We will get ample opportunities to view and photograph the bears from a favourable distance. Q5. How much time will we get for bear viewing? Bear viewing on the coast is often dictated by the tides. We will spend as much time as possible viewing the bears. 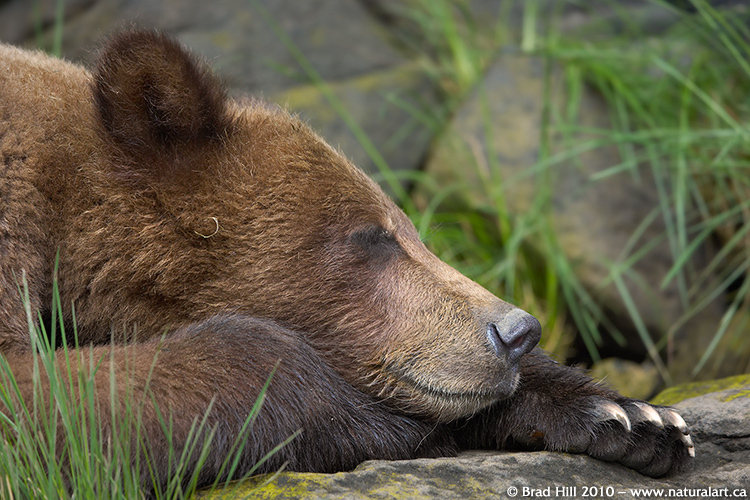 We will move from one bear viewing situation to another throughout the day and the majority of each day will be spent with the bears. Q6. What is the maximum group size? Our maximum group size is 9. This small group size is favourable because it creates a more intimate setting and makes it easier to move as a group. Q7. Are your boat trips good for families? Ocean Light II Adventures offers trips that are fantastic for families. We are a family run company and are always willing and excited to get family groups on board. The Queen Charlotte Islands is an amazing family destination because of the variety of activities available and the small distances needed to travel. As well the wildlife is incredible and the opportunities for active pursuits such as kayaking, hiking, fishing and exploring unsurpassed. Q8. Can I bring my laptop? Yes, you can bring a laptop. The boat has an inverter with 120V power at all times. Q9. Can I charge batteries? Yes, the boat has a number of regular household outlets for charging batteries. Other electrical appliances can be used but may need the generator so check with the crew before using. Q10. Are rubber boots absolutely necessary? Rubber boots are absolutely necessary on all of our trips. We do have many extra pairs of rubber boots on board which we lend out to our clients. If you want to borrow boots just let us know in advance. Q11. Is a sleeping bag necessary? A sleeping bag is necessary as well as a sheet and pillow case. Ocean Light II Adventures also has extra sleeping bags on board which are available for use. If you want to borrow a sleeping bag please bring an extra sheet as a liner and let us know in advance. Q12. Will I need a tripod? You can bring a tripod for your camera and it may be useful in certain situations. But on our trips we follow the bears’ daily activities and therefore move about quite a lot. At times we can be in one place long enough to set up the tripods - a monopod or beanbag can be useful when shooting from the zodiac. Q13. Can you accommodate my dietary restrictions? Yes, we can accommodate any dietary restrictions as long as we know about it in advance. We strive to serve healthy organic food, seafood fresh from the ocean (whenever possible), homemade soups, breads, salads and baked goods. We can take care of your food allergies, intolerances, likes or dislikes. Q14. When do I have to pay for the trip? For each trip a deposit is due at time of booking and final balance is due closer to the trip date. Deposit amount is $1,000 CAD for all trips, EXCEPT for the Grizzlies of the Khutzeymateen trip which has a deposit of $500 CAD. Final payment is due 120 days prior to your trip. Q16. Should I get trip insurance? Yes, we highly recommend that you take trip cancellation insurance. Ask your insurance agent because your current policies may have a travel clause. Otherwise we recommend M.H. Ross Travel Insurance (1-800-423-3632 or www.tripinsurance.com). Q17. 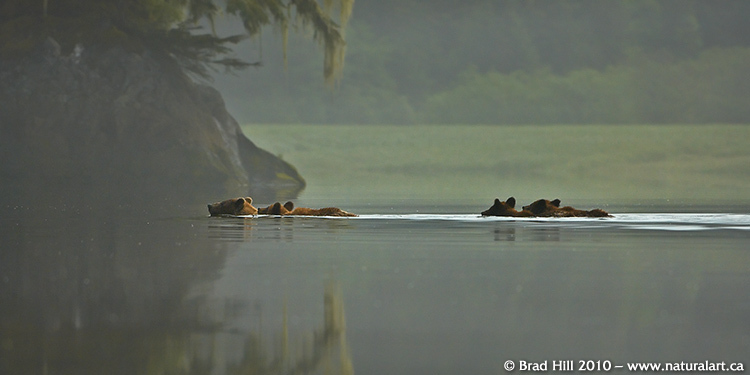 Why do your Great Bear Rainforest Explorer trips start in one place and end in another? The Great Bear Rainforest is a difficult area to access. The distances between ports for a sailboat are significant. We want our guests to have as much time as possible in the prime wildlife viewing locations and we want to spend less time getting to these places. A one way trip allows us to access the best areas for wildlife and scenery in the most efficient manner. Q18. Should I bring hiking boots? Hiking boots are not necessary on our Grizzlies of the Khutzeymateen and Great Bear Rainforest Explorer trips - they are heavy and add to your overall weight. 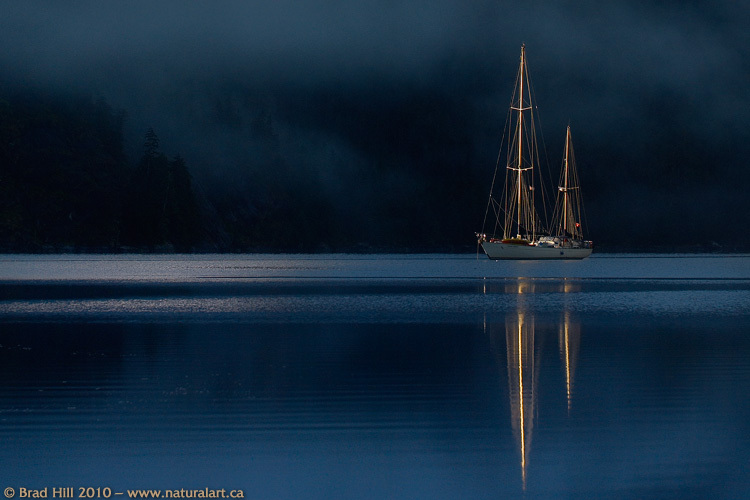 Every time you leave the sailboat and get into the zodiac to go bear viewing you will wear your rubber boots. When you are on the sailboat you need comfortable shoes with a non-marking sole to wear both inside and outside. Q19. Is alcohol allowed on board? Yes, we serve wine with dinner and we invite you to bring your own spirits or liquors if you choose. However our boat policy is that no alcohol will be consumed until the anchor is down for the night and there are no more plans to go off the boat either in kayaks or the inflatable. Q20. Do you offer custom tours? Yes, we can customize a trip to meet your needs. We can offer special prices for full boat bookings and can facilitate any dreams and desires. Just contact us with your thoughts and we can work to put something together for you. Q21. Will we see grizzlies in the Charlottes? No, there are no grizzlies in the Charlottes, but the black bears found there are among the largest on the planet. 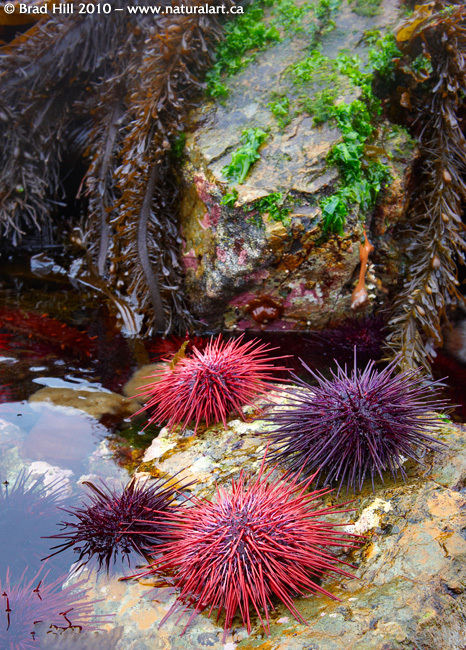 They feed on the rich intertidal zones and salmon and other food is always plentiful. The black bears are very tolerant as there is no hunting allowed in Gwaii Haanas National Park. Q22. Will we fish on tours with Ocean Light II Adventures? Yes. In the Queen Charlottes we will fish for halibut, lingcod, snapper and salmon as well as crabs. On our bear trips we will fish for Dungeness crabs and, if opportunities present themselves, for salmon and halibut. If you want to participate in fishing you must purchase a saltwater fishing license. Q23. What is a Spirit Bear? Spirit Bears are extremely rare, white-phased forms of the American Black Bear (Ursus americana) - it is thought that between 200 and 300 exist on the planet. 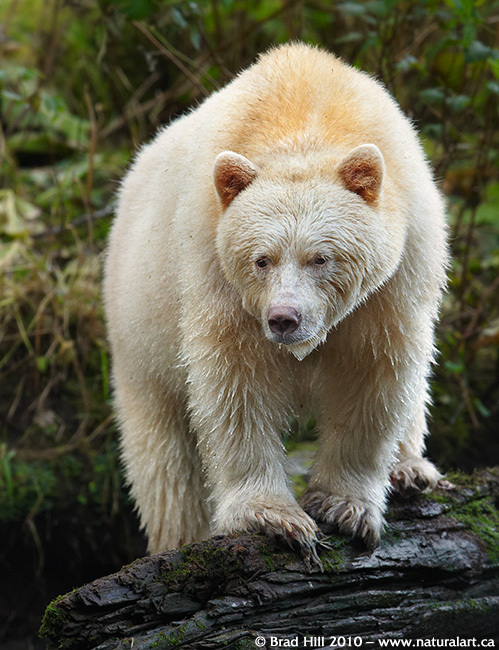 The white coat colour is controlled by a recessive gene which, for some unknown reason, occurs in higher frequency on a remote and tough to access roadless portion of the northern coast of British Columbia. On a few islands in this region between 10 and 20 percent of the bears are white Spirit Bears. During our Great Bear Rainforest Explorer tour Spirit Bears are often seen. Q24. I like to kayak. Are there kayaking opportunities on all your tours? Yes, there are opportunities for kayaking on all our trips. Our Queen Charlotte Islands trips offer the best kayaking experiences as there are many different bays and coastlines waiting to be explored by kayak. 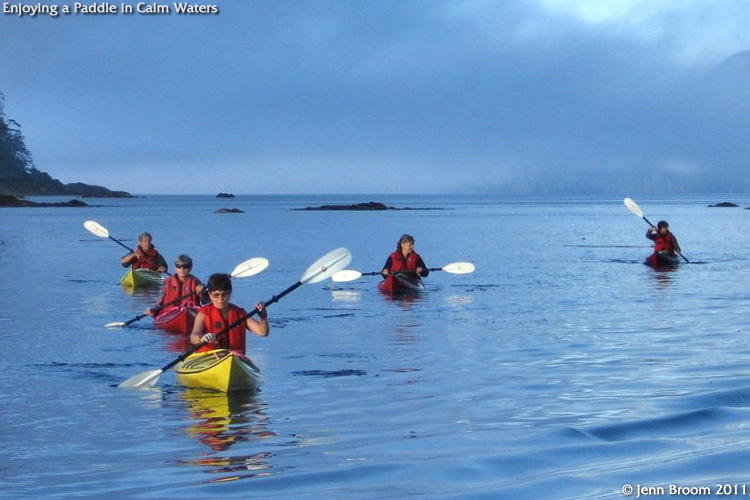 Our Marine Mammal Explorer trips also offer sheltered kayaking while the Ocean Light II is at anchor. On our bear viewing trips there are fewer kayaking opportunities as the focus of these trips is more on the wildlife viewing. But if kayaking is important for you we can make time for this in the most suitable locations. Q25. Do you offer mothership kayaking tours and why would I choose to go on one of these? Yes we offer mothership kayaking tours in conjunction with Butterfly Tours. These trips allow you to get more kayaking opportunities and get the comfort of the Ocean Light II. We will use the sailboat to transport you to great locations from which you can do a longer paddle. The boat will meet you at a designated spot and you can then enjoy the luxury of the sailboat, your own cabin and delicious meals. Q26. How close will we get to the orcas on the Marine Mammal Explorer trip? 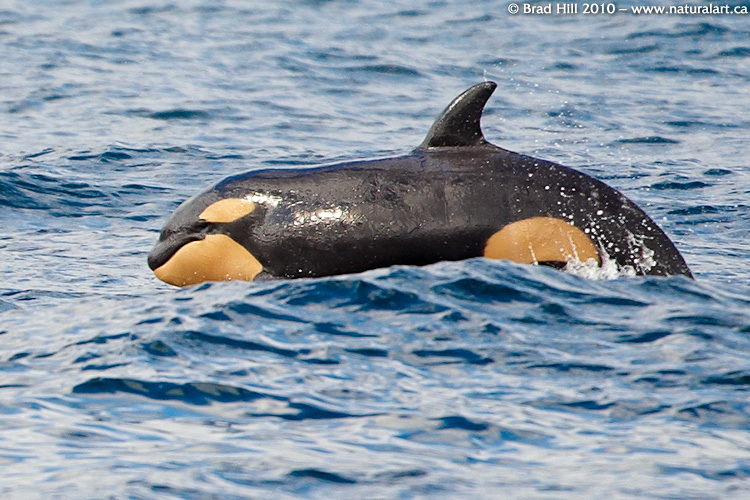 There are strict guidelines for boat traffic around orca whales and other marine mammals. We must adhere to these distances and then shut down our engine. 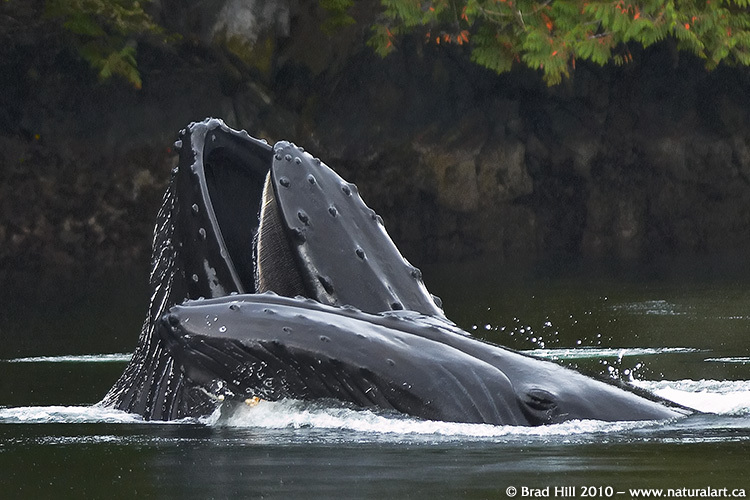 However, at times the whales will approach us (while blatantly violating the guidelines!). We will also have a hydrophone on board that will allow us to listen to the whales. Q27. Are there facilities on-board to dry clothing/gear that may get wet during daily activities? Yes, the boat is equipped with a furnace which blows warm air into all the cabins. In addition there is a spacious engine room where we hang all the wet gear each night to dry. In order to keep the inside of the boat dry and comfortable we do not bring wet gear into the main living area or cabins. Q28. Do I really have to stay within the suggested weight restrictions for my baggage? Yes we request that you stay within the suggested weight limits. We choose to use floatplanes to transport our guests to and/or from the boat but the planes have weight restrictions. Our fresh food is also brought in on the floatplanes. The Ocean Light II, while being spacious, is still a boat and storage space for extra gear is always limited. Please follow the list of suggested clothing and equipment carefully and remember your stay on board is just 4 or 7 days. Q29. I notice that you offer special photo tours as well as your standard tours. Are there good photographic opportunities on your standard tours or do I have to go on a photo tour to get good chances to capture great images? All of our tours offer excellent photographic opportunities. Our photography tours are very similar to our standard tours but to accommodate the additional gear of photographers - and to maximize shooting angles from our inflatable boat - they are limited to fewer participants (normally 6 clients plus the photography guide). Many of the photography tours also include a full day of photography instruction before boarding the Ocean Light II.